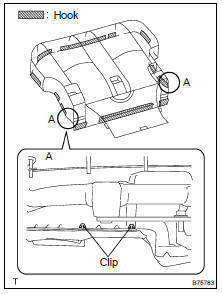 (a) Remove the screw and reclining pedal cover LH. HINT: Use the same procedures described for the LH side. 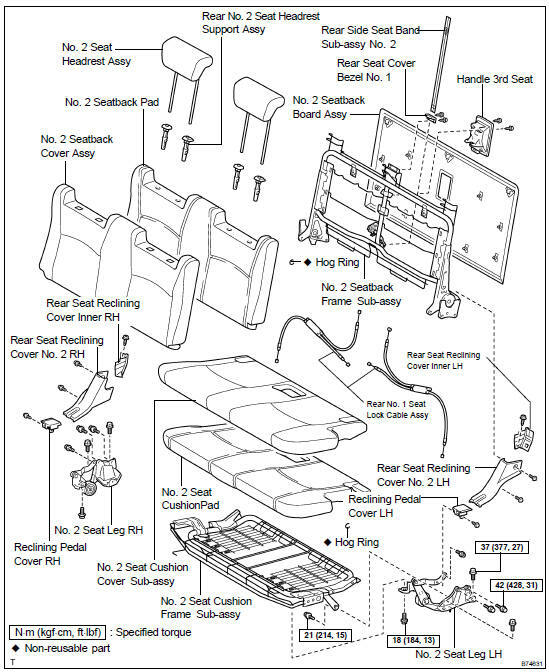 (a) Remove the 2 screws and rear seat reclining cover No. 2 LH. 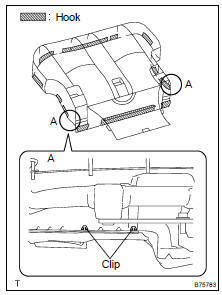 (a) Remove the screw and rear seat reclining cover inner LH. (a) Remove the 4 bolts and rear No. 2 seat. (a) Using a torx) socket wrench (T45), remove the sub seat bolt. (b) Remove the 4 bolts and rear No. 2 seat leg LH. (a) Remove the 4 clips and hook. (b) Remove the hog rings and seat cushion cover together with the pad from the seat cushion frame. (c) Remove the hog rings and seat cushion cover from the seat cushion pad. (b) Disengage the 2 claws. (c) Disconnect the rear No. 1 seat cable and remove the handle 3rd seat. (a) Remove the 7 clips. 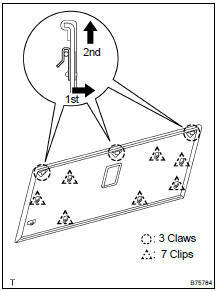 (b) Disengage the 3 claws and remove the seatback board. (b) Remove the hog rings and seatback cover together with the pad from the seatback frame. (c) Remove the hog rings and seatback cover from the seatback pad. (a) Install the seatback cover to the seatback pad with new hog rings. (b) Install the seatback cover with the pad to the seatback frame with new hog rings. HINT: When installing hog rings, take care to prevent wrinkles as little as possible. (a) Install the seat cushion cover to the seat cushion pad with new hog rings. (b) Install the seat cushion cover with the pad to the seat cushion frame with new hog rings. HINT: When installing the hog rings, take care to prevent wrinkles as much as possible. (c) Install the 4 clips and hook. (a) Install the rear No. 2 seat leg LH with the sub seat bolt and 4 bolts. (a) Install the rear No. 2 seat with the 4 bolts.